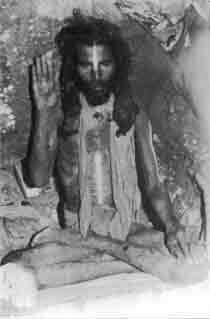 Ayya did intense tapas for over 18 years in a cave near the peak of the sacred Thiruvannamalai mountain. During those years of meditation in silence, He drank just a glass of milk a day. He was in the state of “Turiya”, i.e, sleepless sleep. Many miracles are attributed to Ayya. As a Siddhar, Ayya pierces the veil of ego by not wanting organizations and disciples around Him. He lives in solitude in his native village near Kanyakumari at present. Basic tenets of Ayya’s teachings: Know the wholeness of worship through lighting a lamp within ourselves and as a lamp we light. 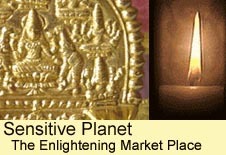 All temples, mosques and church and all Divinity exists within the lamp. Awakening to be Spirit, evolve by serving others. Ayya follows the path of his Guru who was called Ayya Vaikunthar. Ayya Vaikunthar was an incarnation of Lord Vishnu. The first Ayya(Ayya Vaikunthar) exposed the sublime Siddha teachings to the common man and created a social movement to rid society of the evils of caste system and ignorance of religion. The waves of empowered divine insight has silently transformed the society of mankind on the whole today. In the southern most tip of South India, a holy place named Swamithoppu (then part of Thamaraikulam village) in Kanyakumari District, is the birth place of Muthukutty. He was born in 1809 to very poor parents Ponnu Nadar and Veiyelal. They initially named him ‘Mudisoodum Perumal’, meaning ‘Lord Vishu with a crown’. But due to objections from high caste Hindus, the family had to change the name to Muthukutty. At this time the atrocities of the high caste Hindus had reached extremes and the poor low caste people were waiting for an end to their miseries. At the age of twenty-two, due to an incurable disease, Muthukutty was bed-ridden for a year. His parents prayed to Lord Vishnu and one day in his mother’s dream, Lord Vishnu appeared and asked her to bring Muthukutty to Tiruchendur (where a famous temple exists for Lord Karthikeya after His victory over the demon Sura) for the Masi festival and told her that He will give a holy life to Muthukutty and relieve the sufferings. Tiruchendur was far away and the family did not have any means to afford a bullock cart. As Muthukutty was not able to walk even a single step, the relatives decided to carry him in a cloth-cradle. They started in the very early morning and had to walk through forests and cross rivers to reach Tiruchendur. By mid-noon they reached a large river (Thottavalli river) and stopped to rest and have lunch. Suddenly the sick man, who could not take even a step, got out of the cradle and started running towards Tiruchendur. The relatives thought that he was running in delirium but could not keep up with him. Luckily they found him on the streets of Tiruchendur. He then continued walking through the four streets and to everybody’s shock, he walked into the sea and disappeared! They were searching the sea but could not find any trace of him. The search went on continuously for two days calling out for him and lamenting but there was not even a single sign of him. The relatives lost all their hope and consoled Muthukutty’s mother for the loss of her son and planned to leave Tiruchendur. But his mother kept on crying and refused to leave the place without her son. She was alone on the sea shore for another day without food or help from anybody. On the third day, the 20th day of Tamil month Masi (March 3, 1833), He came out of the sea with a divine looking face. His mother ran to embrace her son, but He told her that He was not her son but is Vaikuntar, an manu avatar of Lord Narayana!. He narrated to her what had happened inside the sea. There, Lord Narayana liberated Muthukutty’s soul and transformed him into Vaikuntar and empowered him in a process known as Vinchai. Lord Narayana asked him to go back to Swamythoppu to do penance for six years, and then relieve the suffering of the poor people and establish a new religion. A little known fact: Swami Vivekanda was blessed by Ayya Vaikunthar and given the sacred turban by Ayya on SWami Vivekananda’s journey as a saddhu through South India just before Swami Vivekananda sat on the now famous “Vivekananda Rock”- at the tip of Kanya Kumari. Swami Vivekananda meditated on the rock at the Soputhern most tip of India to be revealed His purpose- to represent Mother India and go to USA for the religion of parliaments. This was the first time ever that Hinduism and the knowledge of yoga was revealed and accepted on a grand scale outside India. No idol worship- to break the discrimination that was encountered by the lower caste who were not allowed in major temples in South India prior to 1940’s. ~ Vegetarianism- so to convey the sacredness of life within ourselves as the lives of all the living. ~ The worship within that sees the Divine within and in all. ~ The Divine to worship within in His/Her formless, nameless attribute. ~ Connecting many with the empowering Siddhar mantras that grows the fire of bhakthi and the light of knowing. ~ To know “Love” as the essence of the Heart. No journey above is possible without having lit the heart cave’s lamp. ~ Worship of Divine in the many ways as each perception seeks. As Swami Vivekananda said, “A cat’s God is a Cat”.